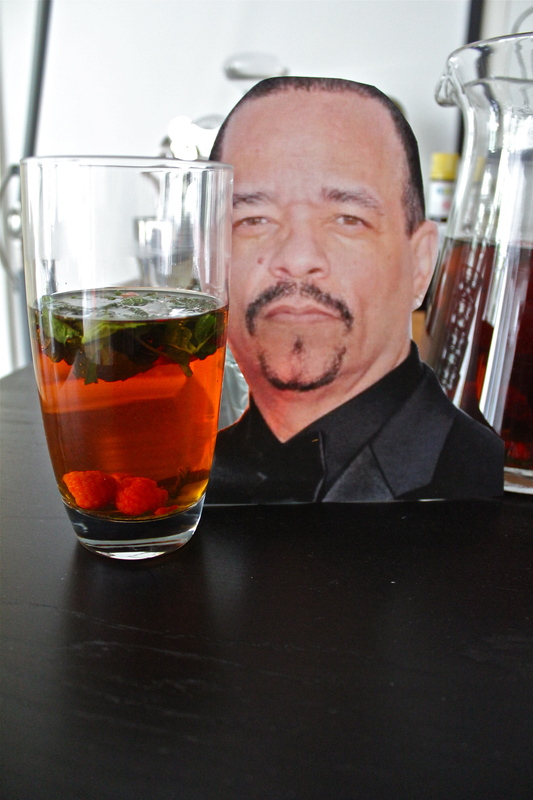 Yes, he isn’t the washing machine kid but damn Ice T is good company. Better yet, he definitely thinks we should become members of the HFPA for our contribution to the arts, Hollywood and the planet. I think that is my favourite part about him. We have been friends for some time, following a chance encounter on the Law & Order set where I was fired for sneezing when playing Corpse #2 (B.D. Wong over peppered my lunch after catching wind I would appear in Jurassic Park 2) and Annelie and Ice have been friends since their days hanging with 2Pac. It was so nice catching-up, hearing about what our dear friend Coco is up to (she helped form and helped choreograph for our dance troupe, Jazz in your Face) and laughing about the time Meg Ryan caught us egging her house across the canyon…all over a refreshing glass of Iced T.
The rich flavour of the rooibos tea cuts through the tart lemon and raspberry, add to that the mint and sugar and you have the makings of a perfect summer drink for when you aren’t rapping or solving crimes. Or learning to play the washing machine. Have I mentioned this kid is the greatest? Steep tea bags in a pitcher of freshly boiled water for 2-3 minutes, or to your liking. Remove tea bags, stir in sugar and leave to come to room temperature. Once cooled, slice lemon into discs and add to tea with the raspberries and mint leaves. Give a good stir, add ice and serve. With or without liquor, obviously. As you’re aware, we decided to prioritise this year’s dates based on levels of fame and importance…as we decided that the only way to have the Hollywood Foreign Press Association waive the So-Cal residence rule for membership, was to be in with the MEGA famous. Who would have thought future co-best friend-om with Tina/Amy wasn’t enough? 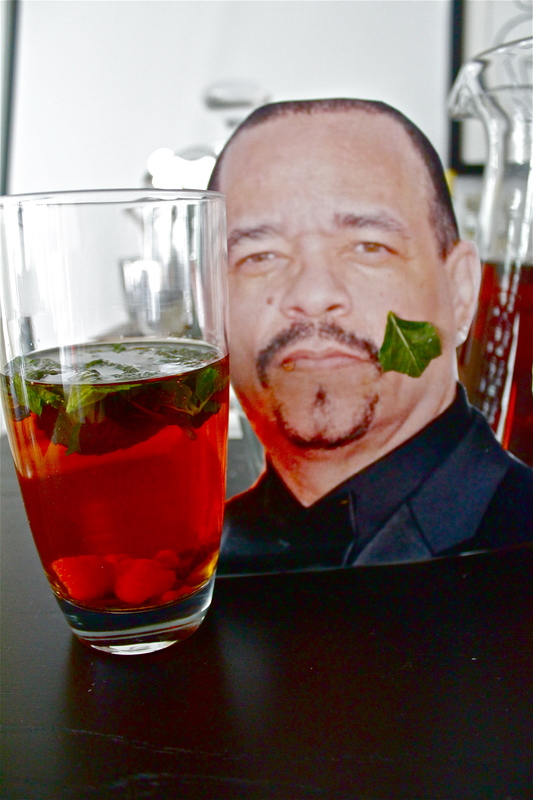 Anyway, during the course of our scientific rankings, I incorrectly identified the kid that did this as Ice-T and I knew that if we didn’t catch/butter-up our (faux) number two for support for HFPA status, Annelie would get aggressive. What says, sorry your house overlooks Meg Ryan’s/why aren’t you as talented on a washing machine/when do we vote for the Golden Globes? Our decision to rank the importance of this year’s celebrity catch-ups was (another) stroke of genius! Bow Wow (he will never be Shad to us, his closest friends), as always, was charming, funny and a straight up pleasure to be around. Fresh from hanging with my (unwitting) ex JVDB and Annelie’s frenemey, Academy-Award nominee (and spoiler alert, soon to be winner) Patricia Arquette on the set of CSI: Something-not-starring-Caruso, Lil’ was able to fill us in on all the haps of the awards season and tinseltown. Sadly, he couldn’t confirm whether JVDB talks about me. I assume he does though? 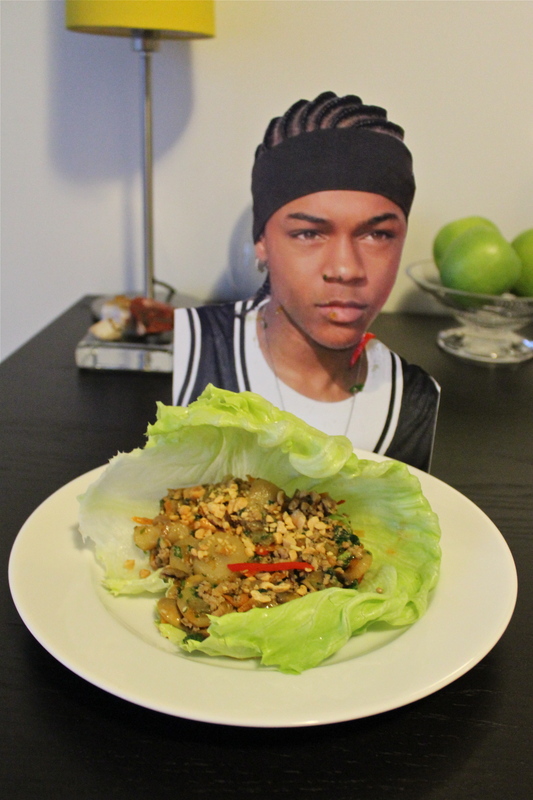 We also got to work on project Bring down Lipdicki 2015 over a celebratory lettuce-cup of Lil’ San Choy Bow-Wow. The heat and spice were perfect for the horrific Queensland summer we are experiencing and were able to open our minds to a new, exciting avenue for revenge, faux-kindness. On that note we’ll probably see Lipnicki soon. In the meantime, enjoy! Trim the lettuce to create cups and soak the lettuce cups in cold water in the fridge to ensure the leaves are crisp. Grate the carrot and set aside. Heat wok or pan over a high heat. Add the oil, onion, celery, ginger and garlic and cook for 20 seconds, then add the carrot and mushrooms, cooking for another 10 seconds. Add the pork mince and fry, breaking it up with a wooden spoon, for approximately 2-3 minutes. Add the sugar, soy, oyster sauce, sesame oil and rice wine and cook for another 30 seconds, before adding half the spring onions, half the chilli and half the coriander and give it all a good stir. Remove from heat. Divide the pork mince mixture between the lettuce cups and garnish with the remaining spring onion, chilli, coriander and peanuts. We’re baaa-aaaack! We hope you had a lovely holiday period and were able to enjoy some down time…because we didn’t. With the resounding success of the documentation of our catch-ups (aka the blog…that you are currently reading), we spent the break fielding calls from our celebrity friends (and hangers-on from the D-List) and hosting date after date. Yes, we love it and enjoy seeing our friends but sometimes you just want to eat two kilos of cookie dough and take a nap in front of the fridge in your underwear, you know? Anyway with such a volume of friends wanting to catch-up, we were forced to initiate a ranking system to deem who was more important to see. As such, obviously, Lil’ Bow Wow was the top of our list. 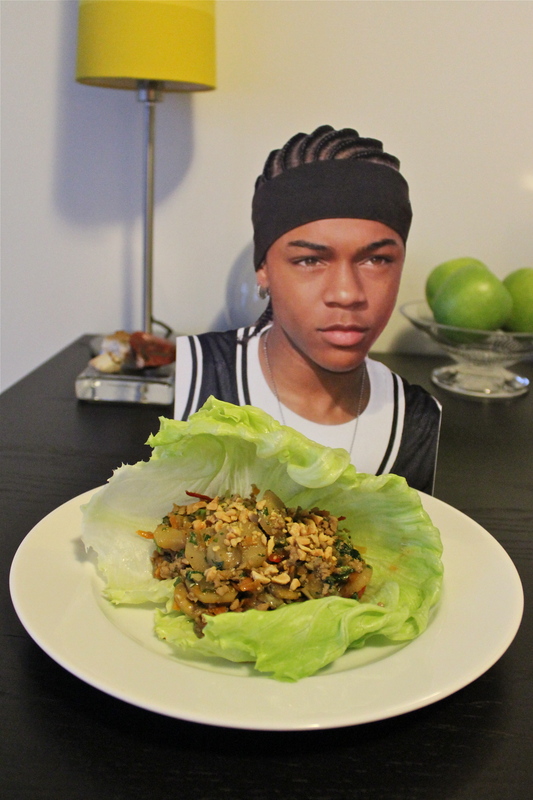 We’ve known Lil’ Bow Wow since he was even lil’er. You see, I was cast as Jonathan Lipnicki’s stunt double in Jerry Maguire for the airport scene; one thing led to another and I was escorted off the set for a brawl that Lipnicki started. After recovering from the altercation, Annelie (she was Tom’s stunt double) and I set about enacting our revenge on Jonathan and stalked the set of Like Mike where we met and befriended Lil’ over our mutual hatred for Lipdicki and a burning desire to bring him down. Nothing bonds three people like a revenge plot and nothing bonds three people for life like a failed revenge plot. What says we will get him eventually, Lil’?